Yes there are a lot of item numbers! Implants are used to support and retain a range of solutions to missing teeth situations ranging from single crowns to bridges to complete full dentures. Depending on the situation, the dentures can also be fixed or removable. It is worth repeating what to watch out for with health funds. Care you may need to be in the health fund for 12 months. Some levels of cover may not rebate this item as it is considered a cosmetic item. There is also a limit for the year. It is important to ask the health fund what is the limit for the year AND when does the year start and finish. Is it the calendar year, the financial year, the date joined, or a date specific for that health fund? This can be important as timing of treatment, if possible, allows the most effective use of your health fund rebates. Some funds have a loyalty bonus that allow for extra rebates. This bonus may have an expiry date, so the timing treatment would be important here as well. The dentist cannot ask the fund on your behalf due to privacy issues. The health fund is a relationship with the patient and NOT the dentist. It’s important to find out eligibility and rebate amount before starting treatment. It’s advisable to get the person’s name, time of call and call centre location of the health fund operator, so if there is any dispute you can prove who gave you the information. This is important if a decision to proceed with a crown was based on the rebate and eligibility for such treatment. This has forced funds to pay the rebate that was stated either over the phone or at a health fund office. Implants often require six months before the final crown or denture can be fully loaded with full functions. Some procedures may not need as much time. However, there may be a minimum period before the next phase of treatment, but there is no maximum time. This means the component of the implant in the bone can be placed at the end of one health fund year, and the final component to fit into or on top of the implant can be placed at the beginning of the following health fund year. Unfortunately, you need to do your homework! 661 Fitting of implant abutment – per abutment – This is the fitting of the foundation (abutment) for a future crown or denture into the implant (also known as a fixture) that is within the bone. 664 Fitting of bar for denture – per abutment- This is a bar that links implants together. This then allows a clip within a denture to hold on to the bar. It is also removable. 665 Prosthesis with resin base attached to implants – removable – per arch. This is the plastic denture that sits onto the bar in item 664. 666 Prosthesis with metal frame attached to implants – fixed – per arch. This a metal based denture that incorporates the bar set up of 664. This means it is fixed (or screwed) into the implants and cannot be removed by the patient. The dentist can remove it if necessary. 668 Fixture or abutment screw removal and replacement- sometimes the screw loosens and this needs to be replaced and tightened down. 669 Removal and reattachment of prosthesis fixed to implant(s) – per implant. This is the denture type in item 666 that is screwed into the implant. The denture may need to be removed for cleaning purposes. 671 Full crown attached to osseointegrated implant – non-metallic – indirect – a crown that is usually all ceramic attached to the fixture ( i.e. 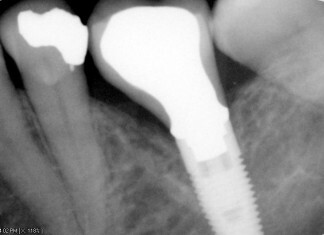 implant in bone via an abutment). Item number 661 is used with this item number. 672 Full crown attached to osseointegrated implant – veneered – indirect – as for 671 but is a ceramic built on a metal layer. 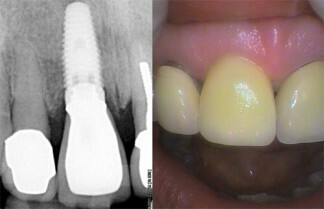 673 Full crown attached to osseointegrated implant – metallic – indirect – this a crown made of metal only, usually gold. 679 Surgical implant guide- this is a guide to help place the implant in the bone based on a predetermined position. This may have been arrived at using a diagnostic template or CT scans or other imagery processes. 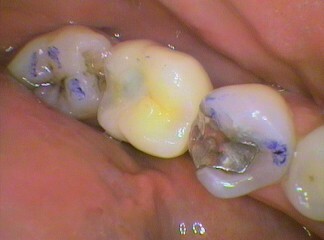 Implant crown using item no. 672 and 661 Implant crown in mouth with access hole filled in	 Left: X-ray of upper right Incisor Implant with crown attached; Right: Photo of upper right incisor implant with crown attached.